Gary Chapman’s book The Five Love Languages offers couples and people in general a means to communicate with each other at the deepest of levels – at the level where a person’s need is discovered and then met through the action of another. When this occurs, Chapman contends, love was the intent and the result both wrapped into one thoughtful act. And, I think that one could easily say, in the context of a troubled relationship’s need for salvation and redemption that The Five Love Languages are a great place to begin the healing process. Now, I would choose all of these languages at different points in time – for myself and for my partner. Specifically, though, receiving Gifts is the language of love that I would respond to the most. I learned this early on. As a third grader I received a banged-up, scratched and dented cornet from my uncle. When Uncle Ken no longer played the horn he thought about my dad and his kids. He thought that one of us could make good use of it. When I began trumpet lessons my family had to endure the sputtering, bleating blasts of my learning to form an embouchure against a mouthpiece of steel. I was told to practice in my bedroom with the doors closed. This kept my brothers at bay, which I did not mind. I was overjoyed about this new gift. It was an unexpected adventure beyond anything I ever knew before. And though I couldn’t form these feelings into words, the cornet made me feel extra special, understood and loved. But an even greater gift awaited me – the gift of music. The original gift grew exponentially. Throughout my life, music would help me through some very rough times. At the time I received the cornet my third grade mind could not fathom all of the possibilities that music appreciation could bring to one’s life. Music afforded me opportunities to relate to others. I could do this through playing the horn itself or by playing with others in a group. Wow! A gift, given to me at one point in my life changed the course of my life and into a positive direction. I was never the same person after I opened that battered cornet case. In Eighth Grade I played my cornet in the concert band. I soon progressed to first chair through many tryouts. I had practiced every day knowing that practice would pay off towards playing more solo and lyrical parts. During that eighth grade year my father, unexpectedly one night, decided to take me to a store after he came home from work. The store, as I found out, sold musical instruments. When he parked in front of the store I leaped out of the car and then immediately straightened up so as to look not too excited. My dad and I entered the store and began looking at all of the cornets and trumpets on display. My heart was in my throat – right behind my tongue! The owner of the store let me play a few notes on a couple of horns and then he placed on the counter a brand spanking new Bach Stradivarius B flat trumpet – a brass beauty if there ever was one. I picked up the horn carefully from the blue velvet case. I gently placed my lips on the ring of the mouthpiece. I was holding The One! I knew this by the feel of the horn in my hands and from the fact that our band’s first chair solo trumpet had a Bach Stradivarius B flat trumpet. Even the angels would choose this horn. The cost of a Bach Stradivarius B flat trumpet in the 1960s was about the same as the down payment on a car. It was a top of the range brass instrument and worth every copper penny. My dad asked me if that was the horn I wanted and again I said a big “Yes.” My dad made the purchase and we left Luscomb’s Music store with a prized trumpet that I determined I would never scratch, dent or leave idle. I wanted to sleep with it but in those days I had to share a bed with one of my brothers. I didn’t want him to mess it up. This horn was a keeper and soon became the means to music I had never dreamed of playing. That night I said “Thank you” in the car at least a dozen times. The purchase was a great sacrifice for my dad and mom. My dad worked two jobs to support our family. Such an unexpected gift met a deep need in me. This gift spoke the clarion language of love to my soul. 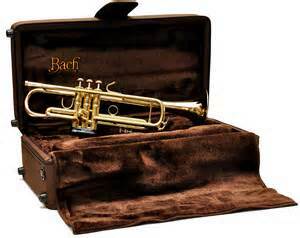 This Bach Stradivarius B flat trumpet has been played in many churches and weddings. I can’t remember how many times I played Trumpet Voluntary as the bride walked with measured steps down the aisle. This horn has also played Taps for the fallen men and women of the military after my father, a village mayor, would give speeches each Memorial Day. Coda: the language of love expressed by this unexpected and sacrificial gift from my father has redounded over and over as a blessing to others (they have told me so) and has transposed my soul into the higher keys of hope and joy. This gift hit all the right notes. I dedicate this post to my father, a charitable and hospitable man. He gave of his time and money to meet the needs of his family and of others. He went to be with the Lord this past summer.